Have you ever wanted to decorate your room but have thought that you don't have enough money to be splashing about on some decor? Well, I've got the solution for you all! You can make your own room decorations for hardly any money and they will be really unique and people will know your sense of style when they hear you made it yourself. This post has one simple idea that will make your walls pop but there are so many more ideas out there for you to try! 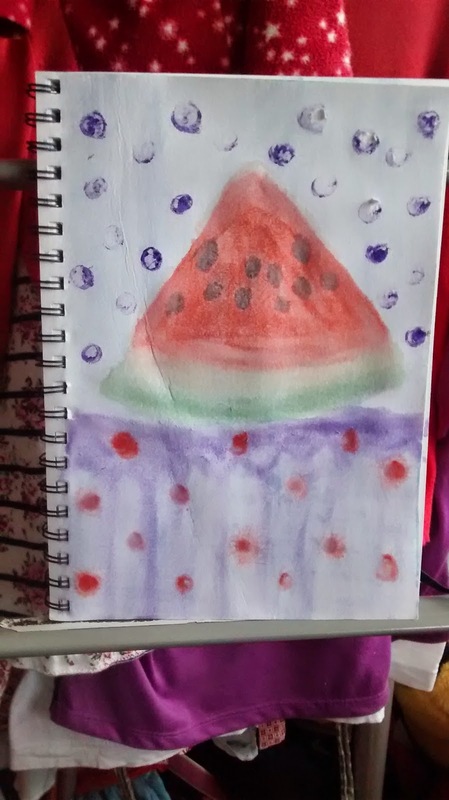 I used watercolor paints on a artist's paper pad to create a beautiful picture of a watermelon slice. I made this because at the moment in my textiles lessons, I am making a cushion with a similar design to this on the front so when I bring it home, I can have a matching picture on my wall. You of course can make any design on your paper with watercolors so you are choosing something that works well with the color scheme/theme of your room. Maybe you could paint an animal or a pattern onto your picture. Absolutely anything can go on your decor. Just to let you know, you could use any drawing material you want but I chose watercolors because the effect they leave on the page makes the watermelon look even more realistic because of the high quantity of water in the fruit I chose and the amount of water used the paint, you can almost see the juiciness of the watermelon on that piece of paper. I hope you enjoy creating your picture to go on your wall.